When we first visited Mexico, I figured out how to say “I’m lost and I have lots of money” in Spanish. I joke that any time we go to a place with a different language, that’ll be the first phrase I learn. I’ll either get home or get mugged. In reality, a more useful phrase is “I don’t understand.” The Japanese version of that is wakarimasen. However, that’s a hard thing for me to admit. I’ll nod my head and overpay for something I don’t want before I confess that I don’t have a clue what’s being said. For the first couple weeks in Japan, I’ve been frustrated with my lack of ability to communicate. Speaking, understanding, reading… it’s all Japanese to me. I realized I needed to cut myself some slack. I hate being bad at something and I’m bad at Japanese, but we’ve only been here for three weeks. Heck, it took us all a couple years to learn our native tongues, right? Still, most “conversations” involve piecing together a script from the phrase book, memorizing it and then reciting it. If the reply is anything more than hai or iie (yes or no), I’m screwed. Last week, I accomplished something pretty big… I exchanged something! 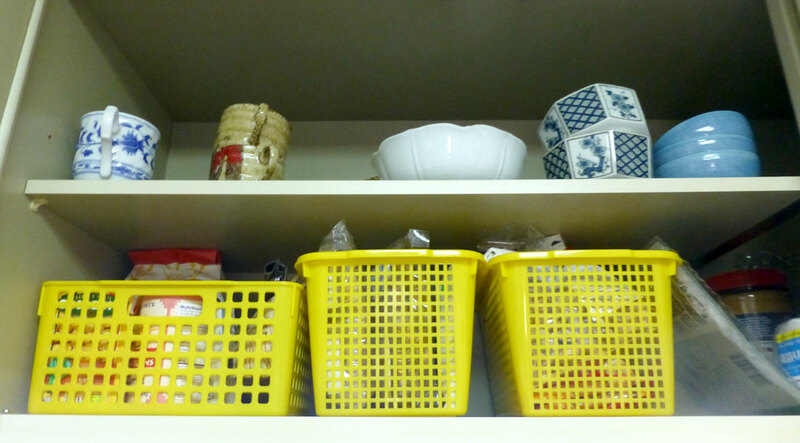 I purchased a few baskets at the 100 yen store to help organize our food cupboard. When I got them home, I unpacked the food shelf and organized the items nicely in the baskets. I put the baskets on the shelf and the cupboard doors wouldn’t close! The baskets were too big. I tried to figure out what else I could use them for and couldn’t come up with anything. I needed to return them. I pulled out the handy phrase book and got to work. I walked back to the store and recited my script along the way… Sumimasen. Kookan shitain desu ga. Ooki sugimasu. Excuse me. I need to exchange these. They’re too big. I walked in the front door with an unexpected amount of anxiety. I delivered my lines like I was George Clooney. The clerk replied with more than hai and I got a little more nervous. So I repeated… ooki sugimasu. She called to someone on the intercom. Her co-worker came to the register with a barcode, the clerk scanned it and the register opened! She counted out my refund and her co-worker took my faulty purchase back to restock. I did it! Success! Our cupboard is organized. It’s a good reminder to celebrate small victories. Even those as small as successfully returning 328 yen worth of plastic baskets. Woo hoo! That sounds like progress to me! The only Japanese I know is what I learned watching Shogun.